If brioche was your date you’d better show up at it’s house with flowers. You’d totally have to open the door for it always, and it would probably go to the bathroom when the bill arrived to make it clear you are the one to pay. This dough is a bit high maintenance; definitely more of a weekend bread. I had a date on Friday with some brioche dough. Yeah, yeah. The top got too tan. A bit sunburned even. The egg wash glaze was like sun tan oil. I didn’t realize I was supposed to tent this bread with foil or wax paper the entire time it was baking, and only ended up doing it for the final 10 minutes. So next time I will tent the dough f’sho and I will make this recipe again to show you the difference. So now I know. This bread is fair-skinned like myself. Maybe it’s the redhead of breads. You should probably know that this bread is like cake. Light and dreamy and buttery and just darn tasty. And when stale it has delicious uses also, since this is the bread French Toast was meant for. And will there be French Toast made out of it so soon? Oui! Oui! And will Jake be the one making it for me? Oui! Put the yeast, water and milk in the bowl of a stand mixer and, using a wooden spoon, stir until yeast is dissolved. Add the flour and salt, and fit the mixer with the dough hook, if you have one. Turn the mixer on and off in a few short pulses, just to dampen the flour. Increase the mixer speed to medium-low and mix for a minute or two, just until the flour is moistened. At this point you’ll have a fairly dry, shaggy mass. Scrape the sides and bottoms of the bowl with a rubber spatula, set the mixer to low and add the eggs, followed by the sugar. Increase the mixer speed to medium and beat for about 3 minutes, until the dough forms a ball. Reduce the speed to low and add the butter in 2-tablespoon chunks, beating until each piece is almost incorporated before adding the next. You’ll have a dough that is very soft, almost like cake batter. Increase the speed to medium-high and continue to beat until the dough pulls away from the sides of the bowl, about 10 minutes. 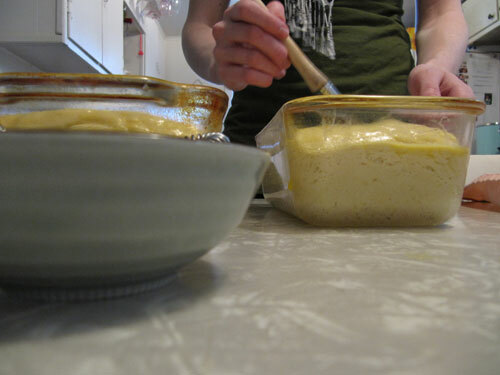 Deflate the dough by lifting it up around the edges and letting it fall with a slap into the bowl. Cover the bowl with plastic wrap and put in the refrigerator. 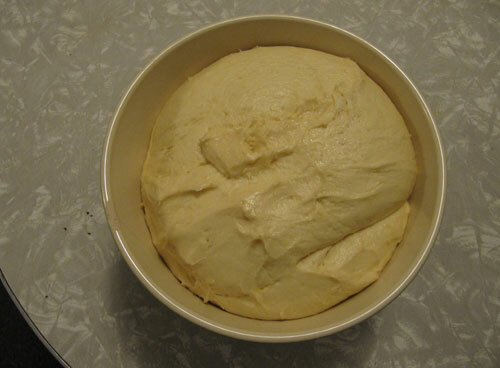 Slap the dough down in the bowl every 30 minutes until it stops rising, about 2 hours, then leave the covered dough in the refrigerator over night. Make the glaze. Beat the egg with the water. 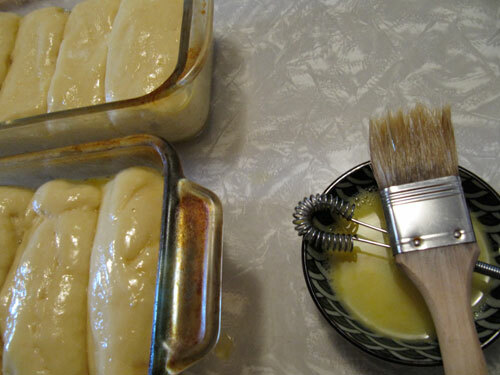 Using a pastry brush, gently brush the tops of the loaves with the glaze. 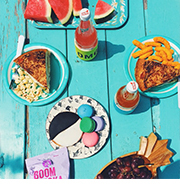 Place the bread pans on a cookie sheet and tent with foil or wax paper. 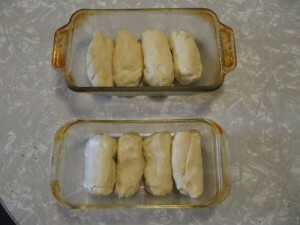 Bake until the loaves are well risen and deeply golden, 30-35 minutes. Transfer the pans to a cooling rack for 15 minutes before running a knife around the sides of the pans and turning out onto the wire rack. Allow to cool for at least 1 hour before slicing. Glazing the loaves. Keepin’ it real. That brioche looks gorgeous! Yum! Thanks! I’ve never tasted any bread like it! 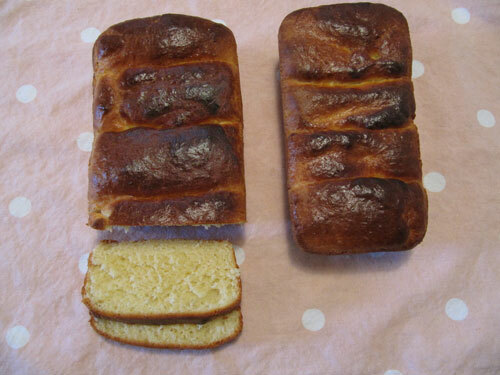 I have been meaning to try to make brioche, but after I researched a recipe I thought it looked like a project! Glad yours turned out. Hey Marcy, I know what you mean! I was going to make it a couple Sundays ago, but when I realized it was more of a two day project I put it off. Totally laughed at the idea of brioche excusing itself to go to the ladies’ when the bill came, Megan 🙂 Awesome. That being said, brioche has every right to be wined and dined because it is bread heaven! It is the Grace Kelly of bread. The Audrey Hepburn of bread! And I do not say those things lightly. Yum. 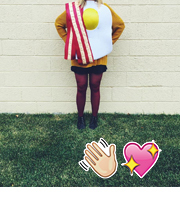 Oh, Beckie. We totally understand each other! Just making sure… do you use a dough hook for all the adding of the eggs/sugar/butter? Or did you switch to the paddle attachment?